Peter’s main research focus is the measurement of probabilistic gas hydrate formation. His background is in experimental and computational physics and before joining the ACLNGF, he was leading research as an ARC DECRA holder on nano-scale magnetic sensors for downstream applications in biological sensing. Prior to that, he worked as a researcher in both academic and joint government/industry labs in France and the USA. 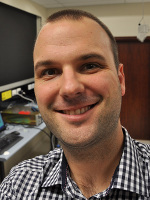 Peter holds a BSc (Hons) from the University of Western Australia and a joint-badged PhD in Physics from the University of Western Australia and the Université Paris-Sud (France).